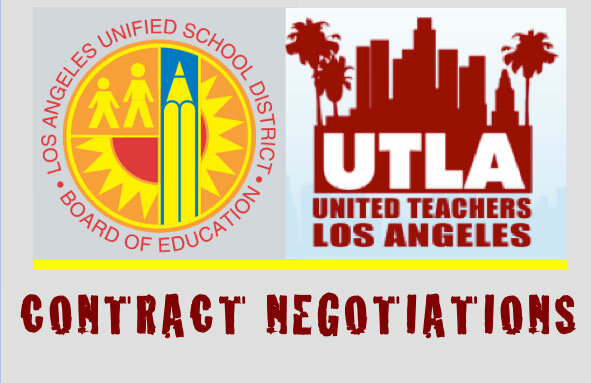 In the latest disagreement between contract negotiators for LA Unified and the teachers union, UTLA, the district says the teachers’ latest salary demand would cost way more than the district can afford while the union president charged that the district could afford it, if the district had the right spending priorities. The new demand of 10 percent a year for one year came last week, superseding the union’s previous demand of 17.6 percent over two years. Rob Samples, Assistant Director of Labor Relations for LA Unified, said UTLA’s proposal plus its request for an annual stipend of $1,000 per educator to cover out-of-pocket expenses for classroom supplies, would run about $250 million a year while the annual stipend would cost the district about $43 million per year. “All together that adds up to $876 million over three years,” he told LA School Report. In a statement, district officials said that “when combined with other projected deficits, the total impact is at least $1.35 billion over three years.” The statement did not discuss other contributors to the projected deficit. In any case, the district said, the union demands would force the district to make numerous cuts in other areas in order to pay for the salary proposals. UTLA president, Alex Caputo-Pearl, countered the district assertions today, insisting that the district budgets are a reflection of its priorities, which he suggests are out of whack. “LAUSD spends too much money on John Deasy vanity projects, including the army of foot soldier bureaucrats in his ‘talent division’, the nearly 700 displaced educators who are still waiting for an assignment, and the additional hundreds of educators sitting in Deasy’s ‘teacher jail’ waiting months or years for due process,” he said in a statement. “The current district budget and future district budgets should prioritize smaller class sizes, more student support services, and competitive salaries for educators who are among the worst paid in LA County,” he added. The union statement goes on to question who is footing the bill for the trip. District officials say Deasy’s trip is paid for by the the sponsoring organization and private funds. LA Unified’s current salary offer to UTLA’s 35,000 members is a 6.64 bump in pay over three years, and a one-time 2 percent bonus, payable immediately. Superintendent John Deasy has said even this conservative offer creates a projected deficit of $100 million as early as fiscal year 2015-16. It is unclear if the district considered expected revenue increases from the state in its budget calculations. State officials will begin releasing projected revenue numbers for next fiscal year in December. “At that point we will get a better picture of the state’s fiscal heath and how much money we can expect for next year,” Lydia Ramos, the district’s communications director, told LA School Report. In addition to the talk of raises, UTLA and the district also disagreed on plans to expand Restorative Justice programs. Last week, the union proposed forming a new committee of educators, parents, students, community, and administrators to research and monitor programs. But the district, which contends that the recently revamped plan is working well, countered that idea, suggesting it add five UTLA members to an existing oversight committee. The next bargaining session is scheduled on Oct. 22.